Bulk handling equipment specialist Bedeschi has supplied a 500tph (tonnes per hour) shiploader to the AdvanSix Plant in Hopewell,Virginia, USA. This shiploader, which will be used to load/unload ammonium sulphate at the AdvanSix (formerly Honeywell) plant, will replace the 40-year-old unit previously in use. 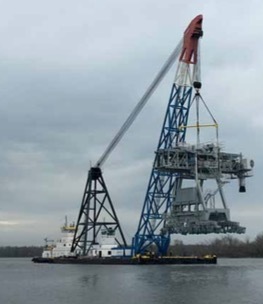 With a capacity of 500tph, and with a unique design — the only one in the world — with a double telescopic boom, the new machine allows the client to load bigger ships than ever before, up to 32,000dwt and 28m wide completely covering the ship, and enabling maximum efficiency in terms of volume and time. All of the conveyor belts are completely enclosed, to prevent material spillage. The telescopic chute, installed on the top of the boom, prevents dust emissions during loading activities. Due to the corrosive nature of the material to be handled, all the parts exposed to said material are made of stainless steel. One of the main parts, the boom shuttle, has been made using special DUPLEX stainless steel. reduced loading capacity of the quay and the reduced rail clearance that required detailed and in-depth structural analysis and stability calculations. The design of the machine allows safe control of the air-conditioned cabin which is equipped with a professional seat, granting the highest visibility to the operator of the loading point.